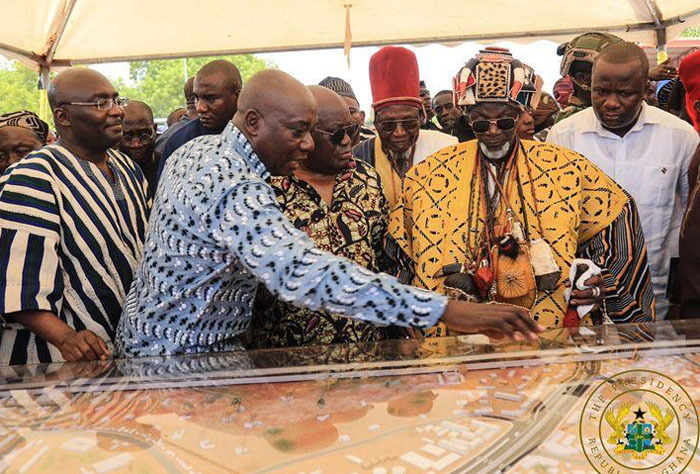 PRESIDENT NANA Addo Dankwa Akufo-Addo has cut sod for work to commence on the Tamale Interchange project. The sod-cutting ceremony which took place today at the Jubilee Park in Tamale, marks the official commencement of the $1.5 billion roads initiatives under the $ 2 billion Government of Ghana and Sinohydro Master Project Agreement. The Tamale Interchange would be the first of its kind in the northern part of Ghana. Vice President Dr. Mahamudu Bawumia, Road Minister, Amoako Atta, Defence Minister, Dorminic Nitiwul, Interior Minister , Ambrose Dery,Deputy Chief of staff, Abu Jinapor and other government officials, joined the President at the Jubilee Park to witness the historic sod-cutting ceremony. It comes as Government through the Information Ministry announced a massive investment in infrastructure development. The Master Project Support Agreement between the Government of Ghana and Sinohydro of China was reached in 2017. It was later approved by Parliament, and two sets of contracts, were laid before the Parliament. The two contracts were the “Engineering Procurement Construction contracts (EPC), Deferred Payment Agreements (DPA). Under the first tranche, a number of roads have been earmarked for construction. Under phase one of the deal, there are to be 84 kilometre Accra inner city roads, 100km Kumasi inner city roads, Tamale Interchange Project, PTC Roundabout Interchange Project in Takoradi and 14km Adenta-Dodowa dual carriageway would be undertaken. Other projects include 39km Sunyani inner city roads, 32.19km Western Region and Cape Coast inner city roads, upgrading of selected feeder roads in Ashanti and Western Regions, rehabilitation of a 38km Oda-Ofoase-Abirem Road, construction of a 66.40km Hohoe-Jasikan-Dodo-Papasu Road, totaling 441.59 kilometres. For the Accra inner city roads, Ga North – Trobu, is expected to get 19.03km, a 23.7km road for Ga Central–Anyaa Sowutoum, Ga East-Dome Kwabenya, 21.70km, Ledzokuku–Teshie 11.3km, Nanakrom–Santo 8.0km. Beneficiaries of the Kumasi inner city roads include Manyhia sub-Metro, which will get 11km road, Suame sub-Metro, 9.45km, Tafo-Pankrono sub-Metro, 9.79km; Asokwa sub-Metro, 9.91km; Kwadaso sub-Metro, 6.29km; Oforikrom sub-Metro 7.43km; Subin sub-Metro, 8.98km; Nhyiaeso sub-Metro 7.00km; Bantama sub-Metro, 10.00km; Asante Mampong, 20.15km. In Cape Coast, three roads at Akotokyir, six roads in Amamoma area, seven roads at Abura New Community and three roads near the Polytechnic Area would be constructed. For the Western Region, there is going to be the construction of Apawusika Road and links; a 10.19km road for Prestea. Some selected feeder roads in the Ashanti and Western Regions, according to the Minister, include a 7.2km Achiase-Wansamere–Awisasu Junction.